Francisco de Vitoria (or Victoria), OP (c. 1483, Burgos or Vitoria-Gasteiz – 12 August 1546, Salamanca), was a Spanish Renaissance Roman Catholic philosopher, theologian and jurist. 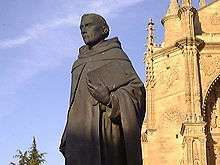 He is the founder of the tradition in philosophy known as the School of Salamanca, noted especially for his contributions to the theory of just war and international law. He has in the past been described by some scholars as one of the "fathers of international law", along with Alberico Gentili and Hugo Grotius, though contemporary academics have suggested that such a description is anachronistic, since the concept of international law did not truly develop until much later. American jurist Arthur Nussbaum noted that Vitoria was "the first to set forth the notions (though not the terms) of freedom of commerce and freedom of the seas." Because of Vitoria's conception of a "republic of the whole world" (res publica totius orbis) he recently has been labeled "founder of global political philosophy". 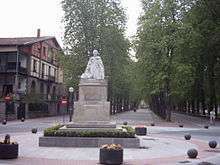 Vitoria was raised in Burgos, the son of Pedro de Vitoria, of Alava, and Catalina de Compludo, both of noble families. He became a Dominican in 1504, and was educated at the College Saint-Jacques in Paris, where he was influenced by the work of Desiderius Erasmus. He went on to teach theology from 1516 (under the influences of Pierre Crockaert and Thomas Cajetan). In 1522 he returned to Spain to teach theology at the college of Saint Gregory at Valladolid, where many young Dominicans were being trained for missionary work in the New World. In 1524, he was elected to the Chair of theology at the University of Salamanca, where he was instrumental in promoting Thomism (the philosophy and theology of St. Thomas Aquinas). Francisco died in August 1546. A noted scholar, he was publicly consulted by Charles V, Holy Roman Emperor and King of Spain. He worked to limit the type of power the Spanish empire imposed on the Native Peoples. He said, "The upshot of all the preceding is this, then, that the aborigines undoubtedly had true dominion in both public and private matters, just like Christians, and that neither their princes nor private persons could be despoiled of their property on the ground of their not being true owners." Vitoria denied that the native peoples could be understood as slaves by nature in Aristotelian terms. He adopted from Aquinas the Roman law concept of ius gentium ("the law of nations"). His defense of American Indians was based on a Scholastic understanding of the intrinsic dignity of man, a dignity he found being violated by Spain's policies in the New World. In three lectures (relectiones) held between 1537 and 1539 Vitoria concluded that the Indians were rightful owners of their property and that their chiefs validly exercised jurisdiction over their tribes. This had already been the position of Palacios Rubios. Neither the pope nor Charles V had a rightful claim over Indian lives or property. No violent action could be taken against them, nor could their lands or property be seized, unless the Indians had caused harm or injury to the Spanish by violating the latter’s lawful rights. A supporter of the just war theory, in De iure belli Fransico pointed out that the underlying predicate conditions for a "just war" were "wholly lacking in the Indies". The only area where he saw justification for Spanish intervention in native affairs was to protect victims seized for human sacrifice, and because of the inherent human dignity of the victims themselves—whose rights were being violated and thus in need of defense. Thomas E. Woods goes on to describe how some wished to argue that the natives lacked reason, but the evidence was against this because the natives had obvious customs, laws, and a form of government. The Spaniards were in the practice of invoking in their American conquests the so-called "Requerimiento", a document read to the Indians before the commencement of any hostilities. The "Requerimiento", declared the universal authority of the Pope, and the authority the Spanish monarchs had received from the Pope over this part of the New World for the purpose of colonizing and evangelizing it. The Indians had to accept the sovereignty of the Spanish monarchs or be compelled to submit by force. Vitoria denied the legitimacy of this document. His works are known only from his lecture notes, as he has published nothing in his lifetime. Nevertheless, his influence such as that on the Dutch legal philosopher Hugo Grotius was significant. Relectiones XII Theologicae in duo libros distinctae was published posthumously (Antwerp, 1604). 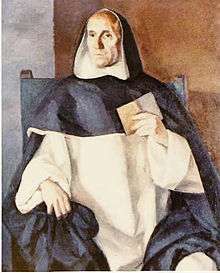 Francisco de Vitoria's writings have been interpreted by various scholars to support contrary policies. Antony Anghie and others argue that Vitoria’s humanitarianism legitimized conquest. Francisco de Vitoria: Political Writings, translated by Jeremy Lawrance, ed. Jeremy Lawrance and Anthony Pagden, Cambridge University Press, 1991. Francisco de Vitoria: Relection on Homicide & Commentary on Summa theologiae IIa-IIae Q. 64 (Thomas Aquinas), translated with an Introduction and Notes by John P. Doyle, Milwaukee: Marquette University Press, 1997. 1 2 Woods, Thomas E. (Jr.) (2005). How The Catholic Church Built Western Civilization. Washington, DC: Regnery Publishing. ISBN 0-89526-038-7. 1 2 Pagden, Anthony (1991). Vitoria: Political Writings (Cambridge Texts in the History of Political Thought). UK: Cambridge University Press. p. xvi. ISBN 0-521-36714-X. ↑ Johannes Thumfart: Die Begründung der globalpolitischen Philosophie. Zu Francisco de Vitorias "relectio de indis recenter inventis" von 1539. Berlin 2009. (256 p.). ↑ Francisco de Vitoria, “The Law of War,” in War and Christian Ethics, ed. Author F. Holmes (Grand Rapids, MI: Baker Book House, 1975), 118-119. ↑ Borschberg, Peter (2011). Hugo Grotius, the Portuguese and Free Trade in the East Indies. Singapore and Leiden: NUS Press and KITLV Press. ISBN 978-9971-69-467-8. ↑ Ernest Nys, introduction to Francisco de Vitoria, De Indis et Ivre Belli, English translation of a substantial portion of Relectiones XII Theologicae, available online.